We are excited to announce our latest winning stair design photo of the month! 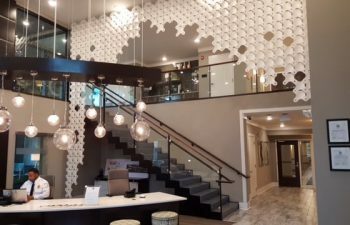 This featured project is a unique modern commercial stair created for Cliftwood Apartments in Sandy Springs, just outside of Atlanta, Georgia. 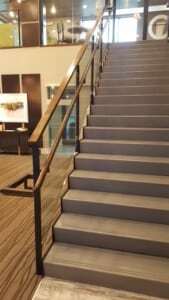 Our Alpharetta, Georgia team was proud to partner with ECI Construction for this innovative commercial stairs project. The sleek, modern staircase is a perfect fit for Cliftwood’s leasing office and resident business suite. Designed to both attract young professional tenants and as a lounge for current renters to enjoy, the eye-catching design and décor set this space apart. 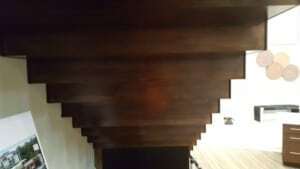 The stair is constructed with a steel carriage and wood under carriage. The freestanding design enhances the stair’s modern, sophisticated appeal while also creating an excellent nook for Cliftwood to display community marketing materials. The terrazzo treads offer both beauty and function, constructed for lasting durability. A unique design material, terrazzo is a composite formed by setting chips of various materials – granite, quartz, marble, glass, etc. – into epoxy resin or concrete. The handrail system further reflects the space’s unique feel, with glass echoing the clubhouse’s hanging displays and lights. 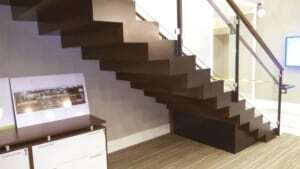 Our team collaborates with builders, designers, and architects to design unique commercial stairs and handrail systems, creating works of art in commercial spaces and homes across the country. Whether the style is ultra-modern, traditional, rustic, or somewhere in between, our team will work to create the perfect staircase to fit your needs. Leveraging a creative design approach, robust project management system, and national capabilities, we are committed to on-time delivery and customer satisfaction in every project. Contact us to discuss the inspiration and vision for your upcoming project.